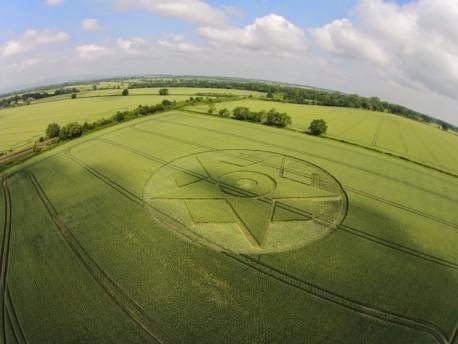 Edward Robinson, the farmer who owns the land and is also owner of haulage firm Robinsons of Worcester, said in the local newspaper he was less than impressed that aliens have chosen to contact him twice, after a similar circle appeared around the Summer Solstice in 2013. Mr. Robinson says the damage to his milling wheat crop has cost him £1,000. Read more in Crop circle near Besford is "vandalism, not art", says fed-up farmer Edward Robinson (Worcester News). See more pictures of the 2014 crop circle here.